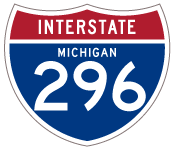 Interstate 296 is the hidden designation for a 3.4 mile section of U.S. 131 north from Interstate 196 to I-96 in central Grand Rapids. U.S. 131 extends south from I-296 as a freeway to Kalamazoo and Portage and north to Cadillac and Manton. 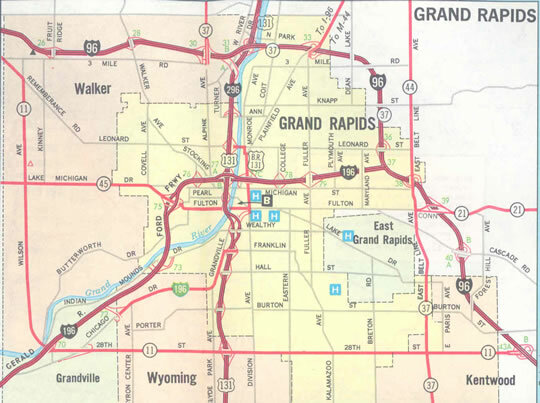 Until 1979 Interstate 296 was co-signed along U.S. 131 in Grand Rapids with the exception of the long two-lane exit ramps to I-96 west and from I-96 east. Signs for I-296 were removed at the request of Michigan and as approved by AASHTO during the October 1979 meeting. 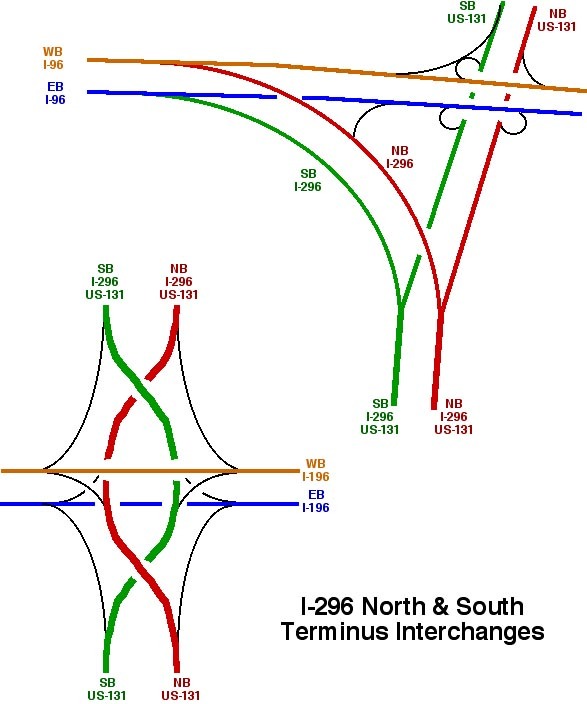 Overview of the interchanges joining Interstate 296 with I-196 and I-96. Graphic prepared by Eric W. Vander Yacht. Ramps for Interstate 196 depart from U.S. 131 south simultaneously. The left exit for I-196 east joins the Gerald R. Ford Freeway across the Grand River to the north side of Downtown Grand Rapids. Photo taken by Eric W. Vander Yacht (06/01). 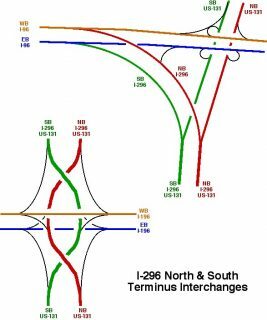 Similar to the configuration along U.S. 131, ramps separate from both sides of I-196 (Gerald R. Ford Freeway) for U.S. 131 south and I-296/U.S. 131 north. The ensuing ramp along I-196 leads to U.S. 131 Business and Downtown Grand Rapids. Photo taken by Eric W. Vander Yacht (04/01). U.S. 131 north at Interstate 196 (Exits 86A-B) from the adjacent parking lot of the Gerald R. Ford Museum. Photo taken by Jeff Morrison (06/25/07). Exit 86A leaves U.S. 131 north for I-196 east toward Lansing. I-296 begins and accompanies U.S. 131 through the succeeding two interchanges. Photo taken by Jeff Morrison (06/25/07). A loop ramp (Exit 31A) joins I-96 west with U.S. 131 and I-296 south just beyond the Grand River. Photo taken by Eric W. Vander Yacht (04/01). Thanks to Eric Vander Yacht and Chris Bessert for additional information on hidden Interstate 296.